The last few years have seen a boom in the oil and gas exploration business in the U.S., driven by new technologies that have allowed exploitation of “unconventional” resources for gas and oil. These resources are often called “resource” plays, because the oil and gas is being produced from shale beds. Shale is known by geologists to be the source or “resource” of pockets of oil and gas accumulated over hundreds of years in more conventional oil and gas sands, trapped by faults and other geological anomalies. 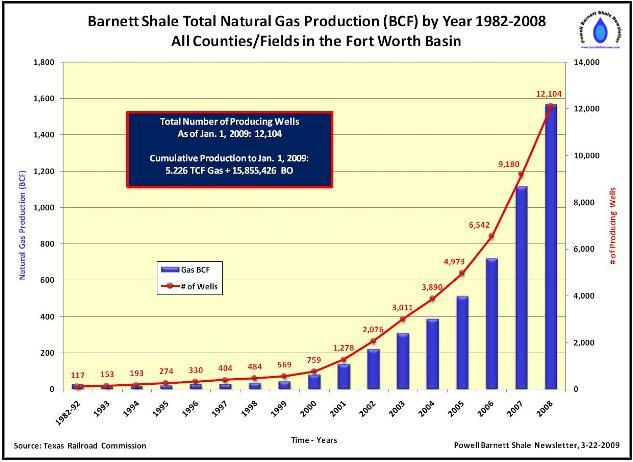 The resource plays in the news over the last couple of years are the Barnett Shale in Texas, in and around Fort Worth, the Fayetteville Shale in Arkansas, the Bakken Shale in North Dakota, and more recently the Marcellus Shale in Pennsylvania and New York, the Haynesville Shale in Louisiana and East Texas, and the recently discovered Eagle Ford Shale in South Texas. Exploitation of these resources has resulted from two factors: improved technology, especially horizontal drilling, and high oil and gas prices. The discovery and exploitation of these shale plays has dramatically increased the U.S. reserves of natural gas. The top producing well in the Haynesville Shale produced 713 million cubic feet of gas in December, an average of 23 mmcf per day. — Lease bonuses in the Barnett and Haynesville Shale plays reached heights unheard of last year — $25,000 to $30,000 per acre. By September 2008, Chesapeake had acquired leases covering 550,000 acres, EnCana and Shell had bought 325,000 acres, Petrohawk Energy 275,000 acres, Devon energy 130,000 acres. Haynesville lease bonuses averaged more than $13,400/acre. The Haynesville play was like the California gold rush. — The Haynesville Shale is 200-300 feet thick. Recoverable gas reserves are estimated at 24-60 Bcf (billion cubic fee, or a million mcf) per square mile. Estimated ultimate recoveries from Haynesville wells have been estimated at 4.5 to 8.5 Bcf per well. — In and around Fort Worth, and in areas of Pennsylvania, landowners began to organize themselves to bargain with exploration companies as a group, to increase their leverage to obtain better lease terms. — Ray Perryman, a Texas economist, estimated that the economic impact of the Barnett Shale on the Barnett Shale Region in 2008 was almost $30 Billion. — Horizontal drilling technology has allowed the drilling of wells in urban areas, including under the DFW Airport and under the campus of Texas Christian University in Fort Worth. — Urban drilling has also lead to increased regulation by municipalities of drilling activities in urban areas. Fort Worth and surrounding cities have adopted increasingly sophisticated and complex drilling ordinances, regulating aspects of drilling and producing wells that have not heretofore been the subject of regulation, including sound abatement, air pollution, pipeline safety, and street maintenance. — Members of the Texas Legislature, now in session, have introduced numerous bills – principally in response to complaints by constituents – to allow municipalities, counties and groundwater districts some authority to regulate condemnation for and location of pipelines, underground disposal of produced water and frac water, and “the quality of the environment.” Industry lobbyists are being kept busy opposing those bills. — The Pennsylvania Legislature is considering bills to impose a property tax on producing minerals and a severance tax on production in that state. The exploration frenzy halted last fall, at the same time the economic crisis hit. Natural gas prices have dropped from a high of $13/mcf last summer to $3.85/mcf this month. The financial crisis was partly to blame for the fall in oil and gas prices, but the success of the exploration companies – at least in the natural gas market – was if anything as responsible. The frenzy of drilling, principally in the resource plays, increased domestic natural gas production by almost eight percent from 2007 to 2008. As if on queue, all major exploration companies stopped acquiring new leases in these resource plays last fall. The national rig count fell from 2,400 last summer to less than 1,200 today, and continues to fall. There was a 56% decline in 15 weeks in active drilling rigs in the Barnett Shale. Devon Energy’s active rigs in the Barnett Shale Region have declined from 35 to 8. Natural gas prices have dropped from a high of $13/mcf last summer to $3.85/mcf this month. A gallon of gasoline now sells for $1.79, a fall from $4-$5/gallon last year. Jay Ewing, a Devon completion and construction manager, said that “the Big Bonanza is over. Everyone is really shocked how fast everything has turned.” Chesapeake, one of the largest independent companies in the resources plays, announced recently that it is shutting in a significant portion of its gas production to await increased prices. Until prices increase significantly, the exploration business will join the rest of the country in struggling through this recession.